OK, you guys ready to let the dogs out? In case you were wondering, we're late here. It rained. Baseball players melt. Had to wait that out. But we're ready to go now -- a mere two hours and 15 minutes later than scheduled. But who's counting? Anyway, you know the drill here. I can't go completely live, but I can knock out half-inning updates and make limitless snide remarks. AU Btm 1: Three players batted. Two struck out. The other lined out. CU Top 2: Nothing much. One hit. No damage. AU Btm 2: Mr. Harman is proving to be quite a problem. Another 1-2-3 inning. CU Top 3: The lack of offensive production is apparently a contagious condition. Now Clemson's going quietly. Still 3-0, if you're wondering. AU Btm 3: Clemson tried its best to pump a little life into your Tigers with a dropped pop-up, but the flatline continues. Mr. Harman, thanks to a double play, has still faced the minimum. CU Top 5: In order without incident. AU Btm 6: Signs of life. Hard hit single and a yet another home run ball pulled back into the park. But things seem to be shifting a bit. It might have something to do with Trooper ... and his towel. AU Btm 7: One runner. Not much else. CU Top 8: Couple of two-out hits and a hard hit third out. Nice play by Fletcher in left to end it. Still 5-1. Two shots left. AU Btm 8: Drama. AU put two on, thanks in part to a weird scene in which a bunt attempt by Fradejas was at first ruled a foul ball until a very animated Pawlowski hit the scene. After a lengthy discussion, that was reversed and Fradejas was awarded first for a HBP. And out came CU HC Jack Leggett, who was none-too-happy. No one was tossed, although I've seen em get run for much less. And all of it mattered not at all. Harman, ace that he is, smoked the next two AU hitters to get out of the inning. CU Top 9: No more damage. AU Btm 9: No real threat. Morris blasted one that's still going, but that was really all. Alrighty, boys and girls, I'm here for actual baseball. Your Tigers are on the field as I'm typing this. As you know, we can't do a "live blog" of the game -- the NCAA frowns upon such things. I'll recap the innings as best I can for ya. AU Btm 1: Considerably less drama. Three to bat, three to sit. JSU starter Austin Lucas threw five pitches. JSU Top 2: Another inning, another runner in scoring position. No harm this time, however. AU still down a run. AU Btm 2: Think back to the first. It went like that. JSU Top 3: Couple of balls to the track, but no harm done. Still one-zip, JSU. AU Btm 3: Couple of balls to the track. Still no harm done by the Tigers. JSU Top 4: A walk and double play. As an aside, you know what's stupid? Grown men at a baseball game yelling at "Blue." 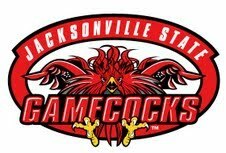 JSU Top 6: And back come the Gamecocks. Tied this baby at 5-5. Brief summary: Auburn wins, 9-7. Sorry, had to finish a few notes and get quotes. But hey, it was on TV. Hey everyone. 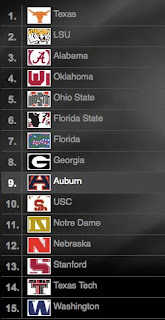 ESPN just revealed its (extremely preliminary) 2011 recruiting rankings based on players the Tigers have committed. Not too shabby. I can't say much about it because, honestly, I know very little about what the other major FBS teams have on board. It's impossible for me to understand what Auburn is accomplishing relative to their rivals, but snagging Kiehl Frazier obviously is a huge deal. Hey everyone. The official disbursement figure, for reasons that still aren't 100% clear to me, is $17.3 million. 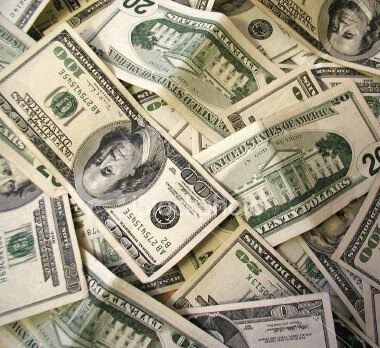 However, SEC teams that qualified for bowls in 2009 split an extra $14.9 million. That money is not distributed evenly. My educated guess is that Auburn's actual take is something in the neighborhood of $18.6 million. That money is due to arrive in July. Not bad for paying $50 in SEC dues. * Jay Jacobs has been named to the SEC's Executive Committee, which includes seven members. He's the only athletic director on the board. "Jay made the motion in the AD meeting of: Let's give this a shot. What do we have to lose? He's a great guy. I really appreciate him stepping up and helping for the right reasons: Let's help a league member through a situation that's challenging." Hey everyone. The SEC commissioner is speaking in Sandestin. * The annual distribution is an average of $17.4 million per this year. That's a 57% increase in one year. That's a pool of $209 million. *Reseeding the basketball tournament: ``That came up through the basketball coaches. They had discussed the current process and maybe a single division. They wanted to continue to study it. At least for the coming year, there will be no change." 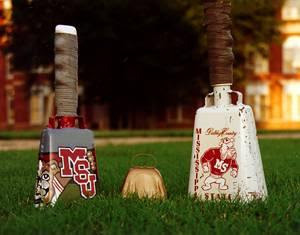 * League approved a "modification" ... recognizing the tradition at Mississippi State and will provide the opportunity for the use of cowbells at Mississippi State so long as they're used at the appropriate time." * There is no change in the main rule. The only change is a recognition of MSU's tradition and only at their stadium and only at a appropriate times. It will be revisited by the league next year. ``If it doesn't work, the league would re-consider going back to the original." * Fine 'em for non-compliance? : ``There's a sunset. If it doesn't work, then we'll go back to the ban of artificial noisemakers." * Expansion: ``We discussed it as you would expect us to discuss it. There's nothing more I can add to that." * ``It is not unusual, in these kinds of contracts, for there to be a provision that if the ... league changes, to be able to sit down and talk about that with your telecast partner." * SEC dues are $50 per year. * Voting for expansion, if it comes to that, requires the support of nine conference presidents. * Is sixteen teams too many for a league? (That's what the Pac-10 is discussing?) "That's a lot of teams to administer. What impact would that have nationally? I don't know. That's highly speculative. There apparently is a lot of talk in the media of superconferences. That's a concept that comes more from the outside than the people who do the work like we do. I've never heard of a need or a drive to get a bunch of superconferences." * On moving tournaments from their current locations: They have one year to go in Hoover. Then the contract runs out. "Hoover does a terrific job." He said the SEC still will explore alternatives and will bring different scenarios to the ADs for a vote during the fall. * He said Hoover is "part of the fabric" of SEC baseball. * Football? ``The game is extraordinarily successful in Atlanta. We have no intention of moving it out of Atlanta." * On the disbursement: Slive noted that the ESPN/CBS deal allows schools to have control over their local multimedia packages. The Big Ten Network annexed all that business. 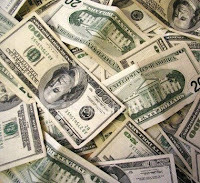 As for SEC schools getting the ESPN/CBS money and being able to keep their own multimedia money, he said: ``If you add it all up, the total is really quite substantial." * On finding a remedy for Alabama's schedule situation: ``As long as people are still willing to help us with it, we're willing to work with it." * The SEC officially opposes an early signing period in football. ``Our coaches oppose it, our ADs oppose it and the presidents oppose it." * Back to expansion: "Strategic and thoughtful could mean doing nothing ... no matter what anybody else does. It could mean doing something. It's just designed to say that we have maximum flexibility as to how we approach this issue." * Back to disbursement, will it rise: "For the foreseeable future, it's approximately the same." * "It's an extraordinary growth. 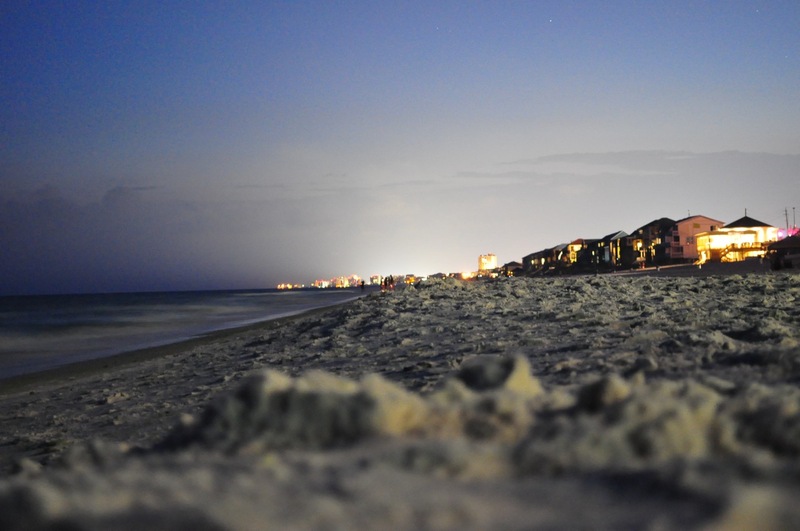 It's gratifying to see the changes." * Expansion again: "We're very comfortable with where we are now. If nothing happened, we'd be very comfortable with where we are." * "I'm not going to discuss any other aspect of expansion." * Unified drug policy? They have talked about that before, though not at these meetings. "It did not get traction. Everybody has their own (policy)." I just spoke with Jay Jacobs prior to his trip into the presidents' legislative session with SEC presidents. *I told him that the official HABOTN® disbursement prediction was $16.75 million. ``You're going to be doggone close." *He said the jump from $11.1 million, which the schools received last season, was known well ahead of time and budgeted. ``Ticket sales are down, priorities (PSLs) are down and it's money we really need to continue serving our customers and our student-athletes they way they deserve." *He was one of the biggest supporters of MSU's cowbell provision. ``I'm very empathetic toward Mississippi State's situation. That's a tradition over there that means so much to the Mississippi State people. I think about what it'd be like if I was in their shoes. I just feel like it's the right thing to do -- to let them sort it out." 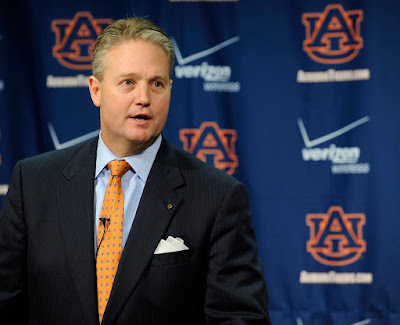 *He said basketball coaches will begin moving into Auburn Arena in July. *He said the soccer/track complex is expected to be finished in September. The project fell behind schedule because of weather and mud problems in December and January. *He said the next major building project will involve an indoor football practice field. He said it must be located close to the athletics corridor. My first thought was the old track, but Jacobs said that hasn't yet been determined. *He said the next building project in line is a new sports medicine facility for Olympic sports. That stuff currently is housed inside Beard-Eaves Memorial Coliseum. Asked if it could be coupled with the football practice facility (a la UK's Nutter Center/Field House) ... and Jacobs said "no." Hey everyone. 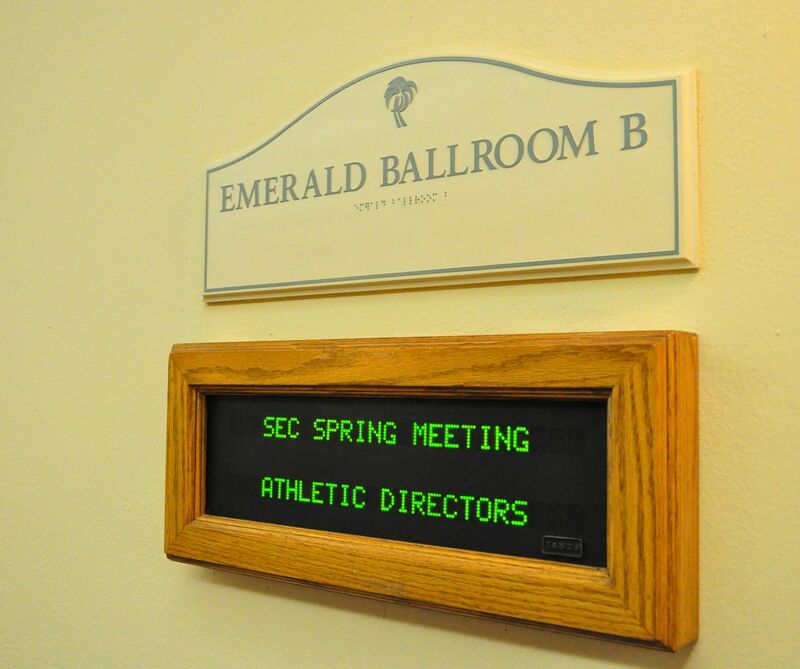 We're live at the SEC Spring Meetings where Mississippi State just received the approval of league athletic directors to allow cowbells into home games. There is a catch. The cowbells may be rattled only at appropriate times. When is appropriate? During timeouts and other stoppages of play ... when most schools play music or messages over their soundsystems. If league presidents approve the measure this afternoon, MSU's plan will have a one-year trial. The issue will be revisited next year. ``I think the general thought was we'll give you a chance," MSU athletic director Scott Stricklin said. ``One of the parts of this proposal that's key is right now there's a sunset clause on it that runs out next year. In other words, we have a year to see if we can be responsible as a fan base. If we're responsible, the league will address it and go from there and if we're not, we'll take a different tack." Hey everyone. I write for a living. I get paid because you read the things I write. So please, help a journalist and read the following pieces of prose. Hey everyone. Bag was generous enough to crank out some capsules designed to give you, the HOTTIES, a better understanding of the teams Auburn will or may play this weekend. Please enjoy. And ... thanks, Color Me Bagg. Opponent: vs. Jacksonville State, 6 p.m.
Notes: This is Auburn’s first home regional appearance since 2003 … Auburn went 13-13 against the NCAA field this season …Auburn is 15th in the latest RPI rankings, just ahead of second-seed Clemson, which is 18th … The Tigers ended the year as the SEC leaders in batting average (.348), slugging percentage (.585), on-base percentage (.424), runs (538), hits (750), home runs (117) and total bases (1,260) … Head coach John Pawlowski played at Clemson and later was the pitching coach there for five seasons in the 1990s. Opponent: vs. Southern Miss, 2 p.m.
Notes: Clemson is making its 35th trip to an NCAA regional – the sixth most in the country … The Tigers are 7-8 against top-25 competition this season … Both the Clemson baseball and football teams won the ACC Atlantic Division this academic year and Kyle Parker played a pivotal role in both titles. Parker was the starting QB and threw 20 TDs and racked up 2,526 passing yards. He’s also one of the best hitters on the baseball team, leading the Tigers in slugging and on-base percentage … The Tigers played 27 games (out of 59) this season against teams currently in the NCAA Tournament. They managed a 14-13 record in those games. Opponent: vs. Clemson, 2 p.m.
Notes: After winning the C-USA tournament, the Golden Eagles are making their eighth consecutive trip to an NCAA regional … Senior right-hander Scott Copeland is 11-0 this season and Southern Miss is 13-1 in games he’s started …Shortstop B.A. Vollmuth has hit 10 home runs in USM’s last 11 games … The Southern Miss infield has turned an NCAA-leading 80 double plays this season, including four games with four double plays and one game with five … USM alum Bret Favre told the Golden Eagles last month that if they make it to the College World Series, he’ll return for another season in the NFL. Opponent: vs. Auburn, 6 p.m.
Notes: This is the third regional appearance for Jacksonville State and will be the Gamecocks’ first tournament since 2006 … JSU third baseman Sam Eberle was suspended earlier in the week for violating undisclosed team rules. He was leading the team in home runs (16) and had 60 RBIs … The Gamecocks have won six straight games and eight of their last nine. The only loss in that stretch came against Auburn (9-7) two weeks ago … JSU’s two top pitchers – senior Austin Lucas and sophomore Tanner Freshour – are a combined 12-1 this season. Lucas has a 4.97 ERA and Freshour’s is at 5.62. Hey everyone. Auburn's football schedule is known, but now the times are coming into view. 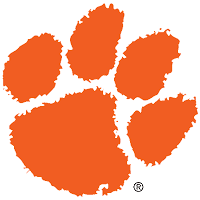 The Tigers' game against Clemson (aka Clempson) on Sept. 18 has been picked up by ESPN. The contest will begin at 6 p.m. CT.
Auburn's Sept. 9 game at Mississippi State also will be televised by The Worldwide Leader. That game will begin at 6:30 CT.
Aight ingrates, here's another round of quotes from members of the AU baseball program. If I have time, I'll get some stuff up from J-State later. There will also be a Pulitzer-worthy preview, along with info boxes on all four teams at the AU Regional, in tomorrow's edition of the Montgomery Advertiser. We never change our approach no matter the park. The mindset is always the same. We go up trying to hit the ball hard in the gaps. You don’t go up trying to hit homeruns. You can never use the park as an excuse because the other team is playing in the same park. Everything’s equal. We just didn’t do a good enough job. I think the biggest thing is that we’ve been more aggressive and gone right at hitters. Our walks are down and we’re more aggressive. A lot of times (games get out of hand) because the pitcher isn’t throwing strikes. That’s the biggest key – to throw strikes. Our staff has done a great job with that. That’s been our No. 1 focus, to compete and throw strikes. I think our experience has helped us throughout the season. It has propelled us the second half of the season. We haven’t been in an SEC Tournament or an NCAA regional, but our guys understand that the game is going to be the same. Hey everyone. So I'm here in the Florida panhandle, where peeps are worried that oil soon will be washing ashore. It's a sad thing. On a happier note, I have stories to share. Good news for you: They're written by me! Bad news: One centers on Alabama. Still, you're not a bad person for reading about the Crimson Tide's schedule problems and their attempts to reach some kind of accord. Hey everyone. Auburn began the day with six open spots in its 2010-11 schedule, but one has been filled. The Tigers will play Rutgers in the SEC-Big East Invitational. That game will be played at University of Pittsburgh and will occur in early December. An official date is to be determined. Hey everyone. Just finished a short chat with Gene Chizik. You probably care about 2.2% of what was discussed. a.) Chizik said a legit, real, for-sure evaluation of Zac Etheridge's ability to play football will happen in mid-to-late July. Etheridge has been participating in non-contact workouts for a while now. He also has been lifting weights. ``He's made some progress. He really has," Chizik said. ``As far as medical details -- is he going to be able to do x, y and z -- we'll make a further, more detailed assessment in mid to late July." b.) Chizik dismissed talk that playing opponents coming off an off week is a tougher endeavor. He wasn't talking directly about Alabama's situation -- the Tide will play six consecutive games against teams that were off the week before -- but it was an interesting plot twist nonetheless. ``You know what? If the team plays really well, the team that had to week off beforehand, then it's: Boy, they had two weeks. If they play really bad, and I've been on that end, it's: Boy they're rusty because they took the time off. It really is how who wants to spin it spins it. Sometimes it's good, sometimes it's bad." Hello there, HABOTN boys and girls. You will undoubtedly note that this post and subsequent AU baseball posts this week are not provided by HABOTN proprietor Jay G. Tate. Instead, you get me, Josh Moon. What does this mean for you? Basically, just no photos. Other than that, the coverage should be somewhat similar to what Mr. Tate provides -- quotes, game updates, etc. I'm certain, however, that it will be just different enough for you to long for Jay. Ah well, it's only for a couple of days. You'll survive. With the intro out of the way, here's some stuff from earlier today. Obviously, the goal was to win the tournament and we fell short of that, but we’re not letting that hang with us. We’ve been able to put that behind us and redirect our focus on this regional. No, we’re just gonna keep doing what we’ve been doing. We can’t change that. We’ve won a lot of ballgames this year playing our style. Our offense has kept us in ballgames and allowed us to come back a lot. We’re comfortable playing our style. The core of this team has been together for three years – some of us a lot longer than that, since we were 10 or 11. We all played travel ball together. I think I played with everyone on this team growing up – everyone in my class. It was kind of a shock when I got here and saw everybody. Seriously, I knew everyone. It’s a pretty special thing, no doubt. We can all talk about what it might be like, but we really have no idea. We haven’t been here. I’m just so happy for the older guys on this team who have put in so much time and been through so much. I can’t really tell you what happened there other than to say that some teams treated the SEC Tournament a little differently than others. There was more urgency there for some teams. I mean, the seventh and eighth seeds were in the championship game. Some of that was the ballpark was just huge. 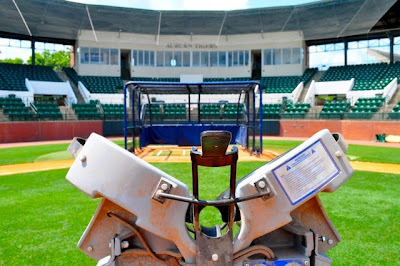 There were a lot of balls hit to the warning track there that would’ve been out of most park, especially here (at Plainsman Park). We got up off the bench five times to celebrate homeruns and watched all of them get caught on the track. Meyer took some time off earlier this year to deal with personal issues related to his health. The coach declined to delve into the basis of his problem other than to make vague references to his esophagus and chest pains. "It's like waking up every morning with a toothache in your chest. Haven't felt anything since late January. I feel fantastic. I have a greater appreciation for the guys around me." He doesn't think it's fair that people get on him for taking leave: ``A lot of them do it without saying leave. They take a few weeks off here and there. It's just not in an article. I have to learn to really trust our staff. I'm pleased with how it's going." Meyer reportedly took his family on a trip to Rome, where he saw Pope Benedict. ``Big Gator fan," he quipped. Sounds like Meyer only saw the Pope from long range. He said doctors, for a long time, couldn't explain what was wrong with Meyer: ``To have someone say we're not quite sure? That's very humbling. Then they said: This is it. Take this. Now it's time to go." On learning to let go: "I can bolt for five days, I've never done that in my life. The stadium's still standing and everything." He told a funny story about how Saban was holding an aggressive phone conversation (presumably with a subordinate) when Derek Dooley came upon the Sabans this morning. Dooley told Terry Saban, Nick's wife, that he didn't understand why Saban would be so rough with assistants back in the day. Now Dooley understands. ``It's so they don't bring all that mouse manure stuff to you," Saban said. ``(Dooley) gets it." He said the only change he's made to his spring regimen is to fill space formerly filled by recruiting responsibilities. Head coaches can have only limited involvement now. ``Not being able to do that, I have more time off, more speaking -- things I don't enjoy very much. I'm not wired to where I can sit around and do nothing. Even at the lake … I got the chainsaw out and was trimming trees. And I have a lot of trees I can cut." He's a straightforward guy, speaks pretty abruptly. He seems to sugarcoat less than the average SEC coach. On getting Tennessee's support system realigned: ``When you come into a low-resource program, you want to get your culture right and do things a certain way. There’s really nobody there to do it. In some ways, it’s easier, but you don’t have the resources to do it. At Tennessee, we have so much support. It’s phenomenal. A lot of areas touch you and it’s hard to get them all on board philosophically in a month. It takes more than a year to slowly get to know each other. We’re making progress. His mother, Barbara, has become a popular figure in Tennessee ... so much so that Derek playfully suggested that she no longer interview with outlets in Tennessee. She already has done that. ``She's violated the interview policy -- and she doesn't give a damn about what I say." On his relationship with Nick Saban: ``Philosophically, we're cut from the same cloth." Dooley said he still enjoys hanging out with Saban. ``I always have a good time." He told a funny story about his first year at Louisiana Tech, which included a thumping at LSU. Afterward, some of his coaches were telling players to keep their heads up. Dooley said he soon told players a different story: ``Bull----. Put your head down. Next time, I'm going to bring a box of Sharpies and some pictures so you can get some autographs. That's the way you played," he said Tuesday. He was asked about the pre-season conditioning programs of yesteryear ... and couldn't help discuss Doug Johnson's regimen prior to the 1997 season. ``He was out playing professional baseball and drinking beer all summer. We did a poor job of giving him a summer plan." On why Steven Garcia played the entire season at quarterback despite playing poorly for long stretches: ``He went the distance because we didn't have anyone else. We had to live with everything he did." He said retirement hasn't been a serious consideration for him. ``I've been going 4 or 5 years for the last 20. Back then, though, 50 used to be on the far side of coaching." He's not into the expansion thing: ``I don't think it's going to happen anytime soon." ``The commissioners who have managed this league of date have done a great job. I just don't want to add any more league games. That's for sure." There is talk that a new NCAA rule will dole out automatic suspensions for players who don't pass nine credit hours per semester. ``I doubt it will affect anybody. If they know they have to get nine, they'll get nine." On Bobby Bowden's retirement: ``He didn't really retire. He had to retire." On the possibility of (again) attempting to ban artificial noisemakers: ``I've never seen it enforced to a point where it matters. Once it's loud -- super loud or just loud -- we just have to adjust." "I'm like you guys, I'm sitting here wondering what's going to happen. I didn't get any talking points. The commissioners didn't give me talking points." On the cowbells at Mississippi State: ``The first time I went there was when I was at Auburn. That was the year they did away with the cowbell -- and enforced it. Who is going to enforce it? That's the question. I didn't really notice. Those stadiums are so loud. You have to be well prepared on your silent cadence. By that time of the year, you're so used to (din)." Hey everyone. 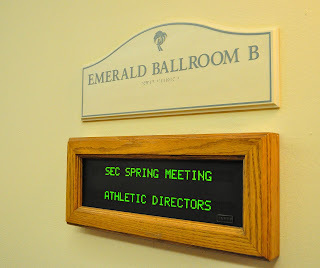 I am on site for one of the least glamorous events of my professional career: The SEC Spring Meetings. I'll spend much of the next four days loitering in a lobby aiming to talk with the league's movers and shakers. For instance, I met Kentucky coach Joker Phillips earlier. He was just walking around with his wife and in a great mood. That's the best way to talk with college football coach. Being a Kentucky graduate has its (rare) advantages. I'll provide updates when conditions merit. UPDATE: Just freed myself from the basement. I had no internet down there. I spoke with Jay Jacobs earlier and saw Tony Barbee, but I don't have anything to report from either guy. My plan is to give you all a run-down of the best things heard today, which includes talk about expansion, Urban Meyer talking about his new life perspective, Saban's talk, a funny story from Derek Dooley. Hey everyone. I am on the road. We now know that Auburn will play host to Clemson (No. 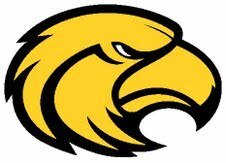 2 seed), Southern Miss (No. 3 seed) and Jacksonville State (No. 4 seed) in the NCAA Tournament, which begins later this week. 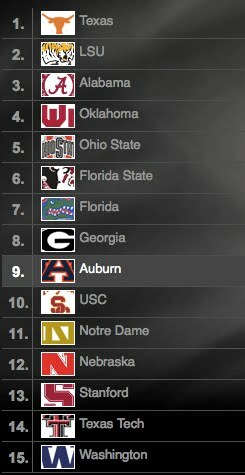 My best guess is that Auburn will be paired with Georgia Tech. If that's true and things hold to form and both AU and GT win their regionals, the two teams would meet in Atlanta a week from Friday with a trip to Omaha on the line. As for this Friday, Auburn will play JSU at 6 p.m. The Clemson-USM game will be played at 2 p.m. I wouldn't be surprised to learn that Brett Favre makes the trip. He's really into USM baseball. UPDATE: I was right. Auburn and Georgia Tech are paired, though red-hot Alabama is the No. 2 in Tech's region. Yow. Hey everyone. 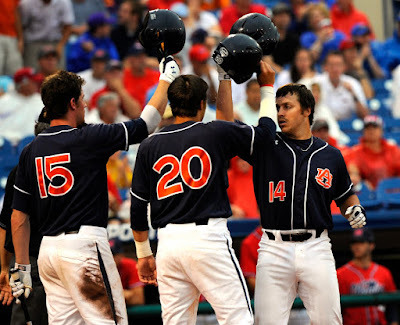 Auburn been chosen as a host site for the first round of the NCAA Baseball Tournament, which begins next week. ``It's a great accomplishment for these kids and our program," coach John Pawlowski said. ``I'm certainly proud of this. It's a great opportunity to host. It's certainly exciting for our program. It's a great step." It's the fourth time Auburn has played host. We don't yet know whom Auburn will be playing. We also don't know which other regional will be paired with Auburn. That information will be learned tomorrow around 11:30 a.m. CDT. Tickets may be ordered online. Or you can call 1-800-282-1957. Hey everyone. My biggest problem with college baseball is the way pitchers sometimes are used in truly unreasonable ways. I followed Jake Peavy's career closely when he was a farmhand with the San Diego Padres. When Peavy was 19 and 20, the Padres required that he be taken out of games once a certain pitch count was reached. That number typically was between 60 and 70. Full count? Doesn't matter. Once that pitch count is reached, the manager went to the mound and Peavy was removed. It works like that for many prospects. Is that going too far? Perhaps. Most young arms can handle more than 70 pitches every five days, but most professional organizations err on the side of caution. College ball, of course, has a different purpose. The goal here is to win. Development simply is a byproduct of competing in the opinion of many coaches. The pitch counts seen in college ball sometimes move into the absurd. Which brings me to the reason for this rant. A kid by the name of Chad Pierce, ace pitcher for Wisconsin-Milwaukee, has endured a busy week. He earned a complete-game win on Thursday. He threw 150 pitches that day. OK. The kid is 23 years old. Maybe he can handle an occasional 150. Today, UWM coach Scott Doffek does the unthinkable. He sends Pierce to the mound in the Horizon League championship game on TWO DAYS REST. And the kid throws 86 pitches. Still, Pierce now has thrown 236 pitches over a three-day period. That's an incredible amount of strain on his arm. Professional teams, which surely are tracking Pierce's performances, know he's thrown 236 pitches and they don't like it. So now the kid's chances of a future injury are significantly higher and as a bonus, his draft stock may suffer.